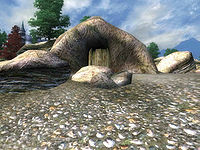 Fatback Cave is a medium-sized cave south of the Imperial City containing goblins. It contains three zones: Fatback Cave, Fatback Great Chamber, and Fatback Deep Basins. This cave contains 89 Cairn Bolete plants and 71 Wisp Stalk plants. 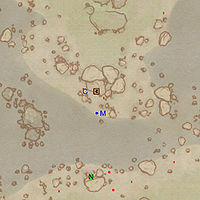 This location's map marker (M on map) is named Fatback Cave (editor name FatbackCaveMapMarker). The entrance door is N of the marker, 40 feet away. This is a fairly routine goblin cave. Door C to the next zone is accessed through a tunnel from the pit in the middle of the large room. On your way through, there is one Swinging Log trap at G, although it may be set off by the goblins. 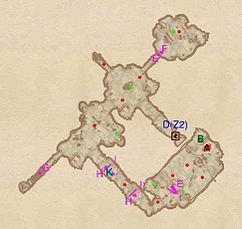 The main goblin lair appears to be the room southwest of the main chamber (with the bedroll at b). It is protected by a stockade, and contains the usual assortment of goblin odds and ends, including three dead rats, a dead skeleton, and a table with 8 gold coins and an iron dagger lying in a pool of blood. 1 Swinging Log trap at location G on map, activated by the adjacent Pressure Plate trigger at F.
1 Swinging Mace trap at E, activated by the adjacent Pressure Plate trigger at F. Unless you like pumpkins, there's no real reason to go near this trap (otherwise, one pumpkin and one enemy are on the other side of the trap). You enter this zone through door C and proceed to the third zone through door D.
The passage from door C leads to the lower level of the large central cavern. Only one enemy is on the lower level, but you are likely to be detected by all of the enemies on the upper level, who may eventually make their way down to the lower level to attack you. You do not need to go past the Falling Log trap at F on the lower level. 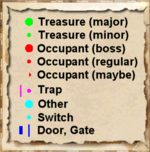 However, if you do, you will find a dead rat and a table with 12 gold coins and a rusty iron shortsword, next to a cozy bonfire; the two bedrolls (b) are past the bonfire. The passage from the bottom level of the cavern to the top level is northeast of the main cavern, accessed from the first left-hand turn after entering the cavern. On the upper level, wooden planks (none of which are traps) allow you to make your way clockwise around the cavern. The second falling log trap, at the southeast exit from the cavern, is placed in a fairly obvious location, on top of a ramshackle assembly of boards. 1 Dead Captive (10% chance enchanted jewelry) at location G on map. The captive is behind a locked Stick Fence Gate. Enclosed with him are a living rat, a dead skeleton, a lettuce, and a potato. 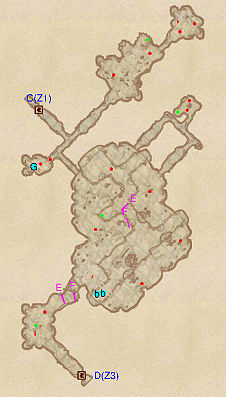 You enter and exit this zone through door D. To reach the boss chest (B) and boss goblin (A), you will need to circle counterclockwise through most of the zone to a point just east of where you entered at D. Along the way are several traps, one of which appears to have killed a previous treasure hunter. 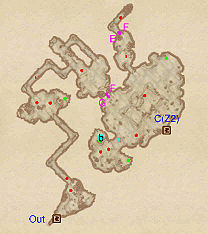 1 Cave In trap at location G on map, activated by entering the passageway. 3 Swinging Log traps at H, activated by the two adjacent Tripwire triggers at I.